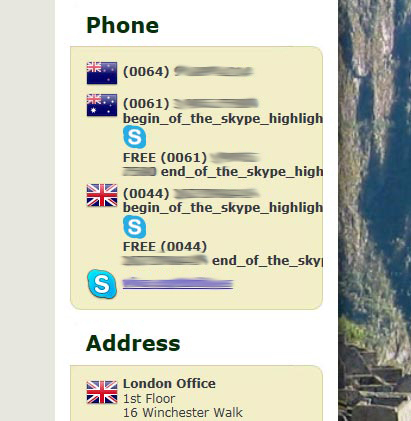 Handy feature for a heavy Skype user, and they are out there. In this case, the templating engine has escaped the injected code, thus rendering it’s elements for the world to see. Ugly to say the least. And a feature that the client does not require either, since the last Skype logo you see there is a direct link to their Corportate Skype profile. (Which does the same thing). 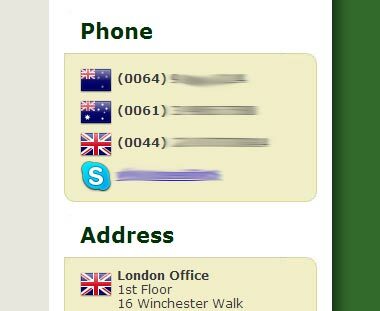 There’s a few out there, but you probably want to get going so here’s the easiest across-the-board fix: Trick Skype into thinking these aren’t phone numbers by simply breaking the Skype’s number detection using a hidden underscore within the phone number. NOTE: Obviously the above code is repeated once for each number in the example. Done. Now get onto something more important.